You can watch every episode of Season 1 of One Life to Live at TOLN . OLTL is currently on OWN Mondays-Thursdays at 3PM and also on Hulu, Hulu Plus, and ITunes. It's impossible to have charm, good looks and be a great actor on the newly re-minted soap opera One Life to Live. Wrong! 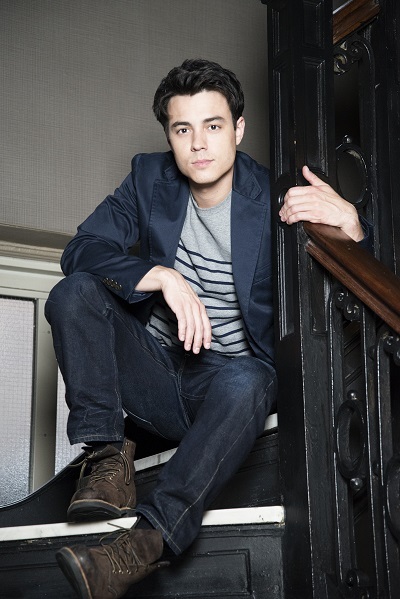 Rob Gorrie is just that and more! Talking to Rob is like relaxing in front of an evening bonfire at a beach. He's not shy when it comes to answering personal questions. My girlfriend and I met three years ago at NYU in Washington Square Park. We both studied Communications. Her name is Sabrina and she's from Colombia. She's really smart and she loves adventure. Sabrina's been extremely supportive of my career. She was there for me when I wasn't booking any work. And now I'm happy that I get to share this recent success with her. Since you're commuting to CT for One Life to Live, you moved to NY from NJ. Have you noticed any lifestyle change now that you're in the city that never sleeps? I love living in the city. I think there's an amazing energy here that's so inspiring. I just recently moved back after spending a little over a year in New Jersey. It was a nice neighborhood but there was no nightlife. I missed being able to come home from work and walk to great restaurants and meet friends for drinks. Now that I'm back living in the city I've definitely noticed a huge lifestyle change. My girlfriend and I never run out of things to do. You recently had a photo shoot with Caravan Stylist Studio at the Carlton Hotel. Tell us about that. My publicist set this one up. It was a lot of fun. I enjoyed working with King, the photographer, Valerie (groomer), and Claudine who runs Caravan. It was at the Carlton Hotel. My wardrobe was styled by Claudine. I hope I get to work with them again in the future. Have you ever been infatuated with someone? Of course! Not in the obsessive way, but in that "I'm really attracted to you," kinda way. It makes me think about middle school and having crushes on girls two grades older than me. Passing notes in the hallways, waiting around corners hoping they'll walk by so you can smile at them. Ah yes, the good old days. On "OLTL," how do you feel about your storyline where now three ladies are seeking your attention? Matthew certainly has his hands full at the moment. He's really fun for me to play because each relationship has a completely different dynamic. He's got Destiny (Laura Harrier) who's the mother of his son but she's falling for his roommate Jeffrey (Corbin Bleu). Then there's Dani (Kelley Missal), his other roommate and long-time crush who can't seem to make up her mind about him. And now he's starting to fall for Michelle (Amber Noyes) whom he met on the internet and comes to town to fight for his love. Working with these girls has been a privilege and I'm compelled to say that they are not only very talented actresses but also very good friends. They are true professionals and getting to know them off-set has been a pleasure as well. Is there any type of sexual tension on set at OLTL or your previous jobs? I don't sense any sexual tension on our set. Maybe there is and I'm just not picking it up... but I don't think so. It's better that way. I've heard some horror stories about on-set romances. What are some things you enjoyed as a kid that you don't have time for now, but wish you did? I wish I was able to play more basketball. That's my second love to acting. I used to play for 12 years competitively. I'm going to try and join a local league this summer. Do you have any crazy or fun fan stories? I remember on our first day of taping in Stamford, there was a crowd of the most incredible fans standing right in front of our studio for hours. They were holding signs and balloons and flowers. They were so excited we were back. We went out to meet them all and take pictures. We even brought them coffee and doughnuts. It was so cool to see their passion for the show. It made me happy to be part of this project. I've been spotted a few times. I'm still getting used to it. My cravings change all the time. One mainstay is chocolate. But at the moment it's the sun and getting back to work on the show. Tell us something behind-the-scenes about OLTL that you haven't shared publically yet. One of my favorite parts of the job is the rehearsal process. The first thing we do in the morning is walk through the scenes with the other actors and the director. Sometimes we're on set and sometimes it's in a classroom with tables and chairs. This is where the show comes to life. We go over blocking and acting notes. Sometimes it's the first time you run lines with your partners and you can find new ways to play the scenes. It's when you can ask to change some dialogue too. It's a collaborative creative process. I just got back from California. I spent two weeks there with my girlfriend travelling from San Francisco to LA visiting friends and every beach we could. Now that I'm back, I'm focused on auditioning for projects I can do before we resume taping in September. What kind of phone and computer do you have? Right now I have the iPhone 4. I've had it for a while. I'm definitely getting the new iPhone when it comes out. I also use a MacBook Pro. What type of man do you consider yourself to be? I like to think my parents raised a hard-working, passionate leader who's a good son and friend. What kind of clothes are you most comfortable in when you're not working? I normally wear Jeans and a T-shirt with sneakers. I don't get embarrassed easily. Honest. And if I ever have been, I've probably purposely forgotten it. Please give a message to your fans. I want to thank them for supporting me in taking over this role. I feel blessed that they enjoy my work. I can't wait for them to see what happens with Matthew's storyline.